Becky Suss, Bedroom (Rubáiyát of Omar Khayyám), 2015, oil on canvas, 84 x 60". In her 2011 memoir, Why Be Happy When You Can Be Normal?, Jeanette Winterson observed of the genre: “Part fact part fiction is what life is. And it is always a cover story.” The act of covering, then, in Winterson’s book and in Becky Suss’s first solo museum exhibition, refers not only to concealment but also to adaptation. In a body of recent paintings and ceramics mostly prompted by the demolition of her deceased grandparents’ home on Long Island, Suss integrates the material facts, fictions, and revisions that constitute her memories of the domestic spaces of her childhood. Seven large canvases depict individual rooms at three-quarter scale—a dining room, living room, bedroom—complete with (re)collections of art, literature, and furniture. Each presents a closely cropped tableau with flattened perspectives reinforced by a focus on patterns that confirms the scenes’ static midcentury period. 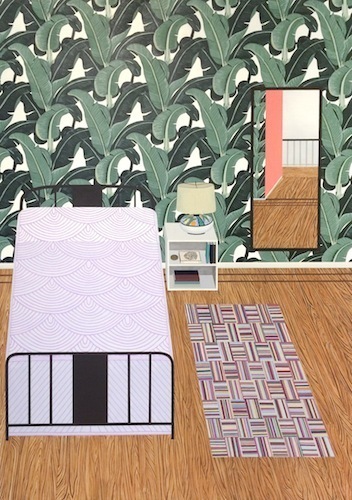 Bedroom (Rubáiyát of Omar Khayyám), 2015, for example, depicts 1950s-era palm-leaf wallpaper, bright wood grain, and a concentric-semicircled bedspread. The objects featured appear desirably without wear, and the books’ spines are blank, withholding information. This is reiterated by the glazed ceramics displayed on the floor—including Untitled (stack of books), 2015—the invitingly glossy surfaces of which deflect attention from the fact that they are stripped of identifying information, bringing these period rooms out into the visitors’ personal space. Two small, square paintings of the artist’s garden in Philadelphia, Kensington, Winter, 2010, and Kensington, Summer, 2010–11, together interrupt the show’s hypnotic sense of frozen time. The skeletons of trees in snow followed by bursts of wiry green have greater perspectival depth and an emotional immediacy absent from the domestic canvases. Their concise portrayal of the vitality of change contrasts with the exhibition’s overwhelming melancholia.